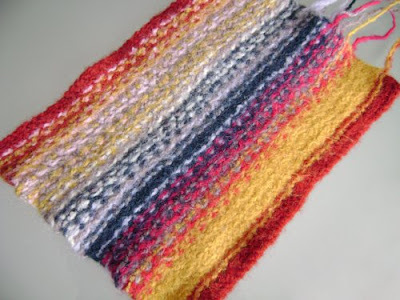 spillyjane knits: Can it be? WIP Wednesday! 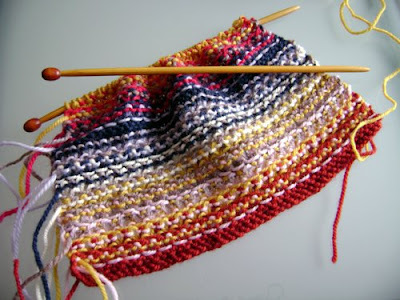 Check it on out -- I'm actually doing one of those "blog things" -- in this case, WIP Wednesday. This is total coincidence, I promise you, but I'm going with it anyway. You haven't seen The Swatch in a while! This is what he looked like the last time we saw him: Well, last night I decided that it would be more fun to waste my Dr. Bronner's soap and scald my hands than to knit another row of boring, BORING Swatch. Here he is after his first bath: He shrunk a bit, which is to be expected in the fulling process. I'm still debating on whether to give him another bath or to start turning him into something else now. And now for a true WIP (this being WIP Wednesday and all,) the Komi mitten from the other day has grown a bit: Ohhh, Mitten. You just might not get abandoned after all. Great colors on those mittens!!!! February 4, 2009 at 6:47 p.m. I like that color combination. 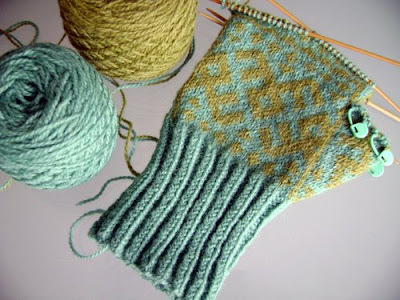 I need to learn your trick to knitting colorwork so smoothly (I am still puckering a bit). February 4, 2009 at 7:40 p.m.
That is so gorgeous!! I like the low contrast between the colours. February 4, 2009 at 8:50 p.m.
Ooh! I wouldn't have thought to pair these 2 colors together but they look amazing! February 4, 2009 at 9:40 p.m. I also wouldn't have put those colors together, but now that you've done it, it looks really great. Save the mitts! February 5, 2009 at 8:58 a.m. The mitten colors are fabulous! Keep working the mittens! February 5, 2009 at 11:56 a.m.
February 6, 2009 at 3:19 a.m.